Art/Noise rock lives and dies by its ability to create a comprehensive mood, playing with sound not only to create an enjoyable melody, but also concocting something theatrical with each track. This is music built for analysis, and understood best by weaving through the layers to find all the elements comprising a single song. Often, we are dealt a handful of lo-fi, clattering, noisy tracks that all feel like one-off experiments with effects pedals and fuzz, where the vocals and guitars are lost in a jungle of punching drums. But, luckily, in some cases we get the perfect combination of noise, brutality, artistic tinkering and pop sensibility with bands like Liars and Japandroids. And with Untied States. The Atlanta band's new release Instant Everything, Constant Nothing finely molds mood and tone with enjoyable music into an album that is dramatic, physical and brutal. Instant Everything, Constant Nothing is about songs that simmer, boil over, and then cool, where a delicate piano opening quickly takes on operatic brilliance and then runs flat into a wall of powerful drums and fuzzy, grinding guitar. 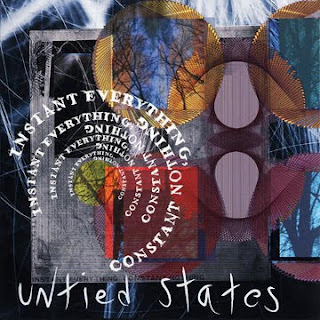 Nothing can be taken for granted as you listen to Untied States, and for those who would quickly flick through tracks hoping to gain some idea what the music is like, you just can't. Everything is too ornate, like elaborate clockwork where the first sound you hear both piques your interest and activates the next section in a song, until where you end up is dramatically different from where you started, and you're left hoping you left a trail of breadcrumbs for reference. This album is like musical time travel. The pummeling, fuzzy opener "Gorilla the Bull" features the trademark lo-fi, buried vocals and an appealing clatter, but Instant Everything, Constant Nothing goes far beyond such humble beginnings. The anthemic "Not Fences, Mere Masks" follows the course of creeping guitar and bass lines that build into a wall of angry fuzz. And then "Grey Tangerines" throws in everything to accompany weary, growling vocals with a scratching heartbeat and '60s-style power-pop guitar solos. And you never know what's coming next. After the punch of "Grey Tangerines," "These Dead Birds" greets you with a gentle waltz and an ominous mood, fading in and out from lament to destruction as it builds slowly into brief explosions that die out quickly. The great success of this album lies in Untied States' ability to craft mood effectively, and vary the pace and style of each song while still holding onto a sense of self. Instant Everything, Constant Nothing never loses its identity, even as each song grows heavy with the weight of production and layered track upon layered track. It's that each track is interactive and impossible to ignore. Like individual sprawling epics, they refuse to fall into the background. The entire disc is exemplary, but I gravitated to "Not Fences, Mere Masks," "These Dead Birds," "Delusions Are Grander" and the feedback heavy closer "Kowtow Great Equalizer." You can check out Untied States via their website untiedstates.us and get a digital download of Instant Everything, Constant Nothing at Distile Records.